Today is my 60th birthday. I have to admit to approaching it with more than the usual triple Capricorn sense of foreboding. This is probably due to my 2nd Saturn Return which has just finished. It has to be said that its different from the 1st one. Usually Capricorns are only too pleased to reach the age of 30 as they don’t make very natural teenagers or even 20 somethings. But 60, well even an old goat has to recognise that time is beginning to run out. Part of the concern of reaching this date has been wondering how to celebrate it. Not in terms of parties, as triple Capricorns don’t do them anyway, but more in terms of what astrology article to write. In fact I have been a lot happier at the prospect of reaching such a milestone, since I decided that it could only be this article. The more I reflect on it, the more I realise that the one single being that had the greatest effect on my life was the Buddha. I have to qualify this by saying I’m not sure that I would call myself a Buddhist although there have been times in my life when I have done. Most people would agree that Buddhism is one of the major religions of the world, but I’m not sure about that. To me Buddha was a scientist, in fact one of the only real true scientists. Science is supposedly about observation of the facts of a situation, but the vast majority of scientists make an unconscious assumption of the credibility of the chief tool that they use to make those observations, that is their own mind. They skip that vitally important stage in their so called scientific method and go on to use and place great faith in an instrument that is utterly unreliable as a means of perceiving reality. The Buddha showed us that if we take the time and trouble to observe we can slowly begin to perceive the true nature of the human mind. Only then can we begin to understand anything else. Before coming across the Buddha’s message I had been seriously ( some might say over ) exposed to religious instruction. I had many years or being encouraged, told and even cajoled into trying to think very different thoughts to the ones that seemed to take up permanent residence inside my head. Much of the time I genuinely wanted to think these uplifting thoughts but the harder I tried the more I failed and the more miserable I became. The world is of course full of people telling others what they should think, but noone seems to recognise the futility of this because people are unable to control what they think from one moment to the next. Whats even worse is that noone seems to realise that they have no control over what they think they think. The more the mind tries to gain control over its own thoughts the more quickly those thoughts escape anyway – it becomes an exhausting and pointless exercise. I may be simply typifying my sign here but what is the point of giving people a message unless you also give them a technique that enables them to experience the meaning behind the words. The Buddha simply gave us a technique to help us observe our own minds. It was basically ‘ Sit still, shut up and watch your breathing ‘. What he knew from his own experience was that if we did this we would slowly become acquainted with tiny moments at the end of each out breath where our minds could become quiet and we would cease to exist as entities separate from everything else. How anyone can turn such simple advice into an ” ism ” is beyond me, but the human mind is cunning and doesn’t like to give up it’s illusory control so easily. It’s easier to turn it all into a dogma with rules of behaviour than it is to actually sit still and do the work. So on first hearing of this technique in my early twenties, I put as much energy as I could find into exploring it. As these things often work out it was about the same time as I first heard about astrology, just as my Progressed Sun reached my Ascendant / Jupiter / Uranus / Neptune T Square. But its only nearly 40 years later that I decided to have a look at the Buddha’s chart. The big problem is which one. There are a number of different dates put forward for the Buddha’s birth over a range of about 100 years. This one really looks unlikely. Its true that most of the offerings portray the Buddha as a Taurus but the Sun and Moon in this sign really doesn’t seem to fit at all. Apart from anything else, most contributors seem to agree that he was born at a Full Moon, rather than a New Moon. From an astrological perspective this seems much more likely given the amount of challenge in his life. Someone who left his beautiful home and family, wife and baby son to spend his life in contemplation’s not likely to have the Sun and Moon conjunct in a fixed sign like Taurus, a Full Moon would show the tension between his path and his roots. This chart for 7.39 am May 15th 564 BC looks a lot more promising. Here we have the Sun in Taurus opposite the Moon in Scorpio. The Sun is also conjunct Pluto. For the one being who made the most profound personal and spiritual transformation in history, it would be hard to find a more appropriate aspect. Another telling feature would be Cancer rising and all of the depictions of the Buddha show a rounded face and bodily appearance that fits nicely with this sign. This chart also gives Uranus rising which could also seem to fit. There is a great deal of power in this chart, but I’m not sure how much sensitivity there is. I would expect Neptune to play a greater role. 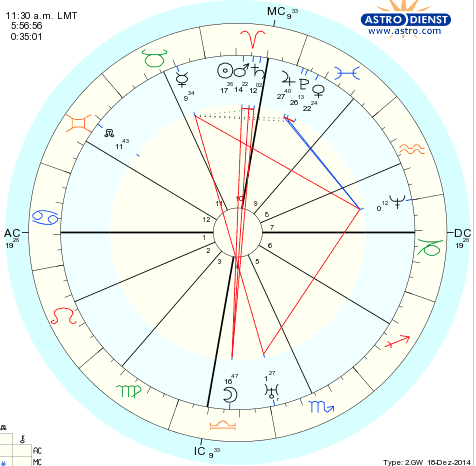 Any chart for noon or just before it on a Full Moon would seem appropriate as it would have the Sun in the 10th house showing his princely status in opposition to the Moon in the 4th. So something about his life would require him to be pulled away from his family and his roots. 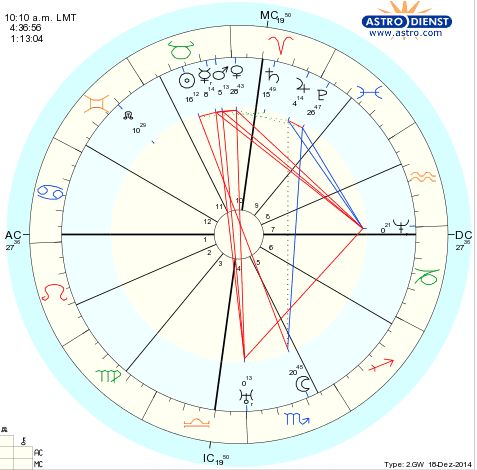 This chart also contains a T Square between a Venus, Mars, Mercury conjunction opposite Uranus focusing onto an apex Neptune. This beautiful pattern with its strong focus on Neptune works very well for such an enlightened spiritual teacher who effectively introduced the world to meditation. Its also true that a case could be made for Leo rising, although this does not fit with the Cancerian image. An earlier time of 10.20 am might work better. This gives us late Cancer as a rising sign. It also puts the T Square into a more prominent position. The apex Neptune is now in the 7th house, which seems very apt for someone who sacrificed his marriage to his beautiful wife Yasodhara to pursue a life as an ascetic. There are a few problems however. One thing that we do know is that an astrologer at the time predicted that Buddha would become either a great warrior king or an ascetic. Indeed this prediction was the reason that Buddha’s parents decided to shield their son from seeing any of the suffering in the world and kept him in a beautiful palace away from the common people. The reasoning behind this was to remove anything that might make him choose the path of the monk. So if we put ourselves in the position of the astrologer, what could be seen in this chart that indicated the possible path of the ascetic ? Four planets in Taurus in the 10th including Mars could easily explain the powerful warrior prince, but any court astrologer that wanted to keep his job would have suggested that anyway. But the ascetic ? Readers would no doubt point to the T Square. Whilst the Sun and Moon are a good guide to character, there’s nothing like a T square to show the direction that a person’s life would inevitably take. So Uranus in the 4th opposing his 10th house planets points to an upheaval at home and a renunciation of his succession and the apex Neptune shows the resulting life in contemplation as an ascetic wandering monk. There’s only one problem with this. Uranus and Neptune would not be discovered for another 2000 plus years and whilst this fact would not alter their profound impact on the Buddha’s life, it would be impossible for an astrologer of the time to predict it. In fact if we restrict ourselves to the available knowledge of the time there is nothing at all to suggest that the young prince would become an ascetic, certainly not enough for an astrologer to risk losing his job and possibly even his life over such an outrageous prediction. Another factor to be taken into consideration is transits. We know that Buddha discovered the truth of the suffering of life that his parents had shielded him from and left his home to become an ascetic at the age of 29. We also know that he became enlightened at the age of 35 / 36. So its pretty obvious that we are talking about a Saturn Return at 29, which would fit very nicely with the recognition of suffering and the turn to a life of disciplined retreat to find the causes of it. The Jupiter Return at age 36 would also fit with his enlightenment. But given that these two events were of such magnitude, we should expect both Jupiter and Saturn to be much more strongly placed in Buddha’s own chart. So the transits would not only be returns but would trigger important points in his chart. I have one other problem with this chart. I don’t feel that the Moon in Scorpio fits the 4th house experience. In order to protect their son from seeing all the suffering, Buddha’s parents surrounded him with everything that was tasteful and beautiful. This does not sound very Scorpio, but it does sound like the Moon in the preceding sign Libra. My feeling is that we’ve just got the wrong Full Moon. One of my Twitter friends pointed me in the direction of this chart from Vedic astrologer Jyothishi. This one is so straightforward that any astrologer of the time would have no difficulty in picking up the major themes. Both Jupiter and Saturn are much more prominent than any of the other charts. The Sun conjunct Mars in Aries in the 10th house is clearly the noble warrior prince. 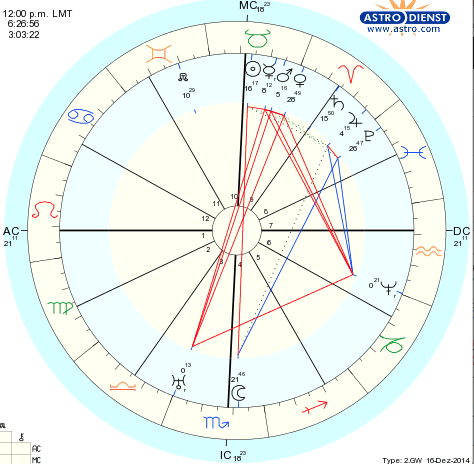 The problem however is the conjunction of these two with Saturn indicating a blockage or an obstruction in this prince’s career path. 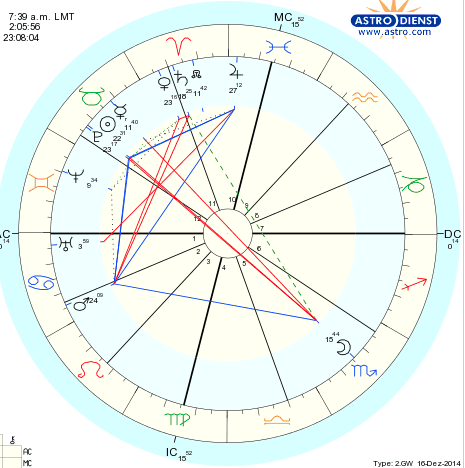 This triple conjunction is also opposite the Moon in Libra in the 4th house, meaning that there is something about this persons beautiful and harmonious upbringing which will undermine this chosen career. So what else is there ? A very strong and extremely different placing of Venus conjunct Jupiter in the spiritual and retreating sign of Pisces in the 9th house of higher thought and understanding. Buddha’s astrologer saw all this and advised that he could choose one path or the other. What we can also see is that Pluto is part of this Venus / Jupiter conjunction, showing the tremendously powerful pull of this path. Surely if there is to be an astrological symbol for enlightenment, it would be hard to beat Venus / Jupiter / Pluto in Pisces in the 9th house. What about a possible date for his enlightenment ? Which planet would symbolise the recognition of the illusory nature of the individual self ? Of course it has to be Neptune, and the Buddha has it as an extremely powerful apex of a T Square. In 587 BC around his 36th birthday, the transiting Neptune was conjunct his Sun, the most potent transit of his life given its dominant position in his natal chart. February 587 also sees both Jupiter and Uranus in late Pisces conjunct Buddha’s Venus, Jupiter and Pluto. The 15th February also has Venus there too. I do feel closely drawn to this chart, not least because my own Ascendant and T Square is within 2 / 3 degrees of its apex Neptune. But also it has a certain simplicity. Astrology is very simple. My own experience in looking at charts is the more important the person is in the history of mankind, the simpler and clearer the symbolism of their chart. The Buddha’s message is simplicity itself, the only reason we don’t see it is because our out of control minds are full of distracting nonsense. So called science believes that its possible to comprehend the nature of things through logical thought. Real science understands that the individual has to step aside for any real comprehension to be possible. To help allay my concerns around my 60th birthday, The Lord Buddha gave me the best possible present, a technique to help me realise that I don’t exist anyway. Hi, I like your detailed analysis and your grasp of horoscope and thank you for this work. I’d like to ask you why did you use Gregorian calendar in calculating Buddha’s chart, the calendar adopted much later in history? Thanks. Thanks Ez, I actually chose the chart that I feel most fits the Buddha’s life. This had been calculated by another astrologer who put the date in as it would have been in the Gregorian calendar. It doesn’t really much matter what actual date he was born on as that is not provable anyway. It’s just that I feel this chart fits the symbolism of his life.